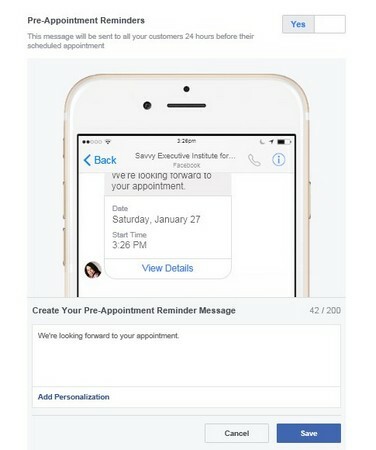 You can use Facebook Messenger chatbots to help you stay in touch with your customers. You may have heard the term chatbot and wondered what it is. A chatbot is a piece of interactive software that uses artificial intelligence (AI) to respond to chat in a conversational way. 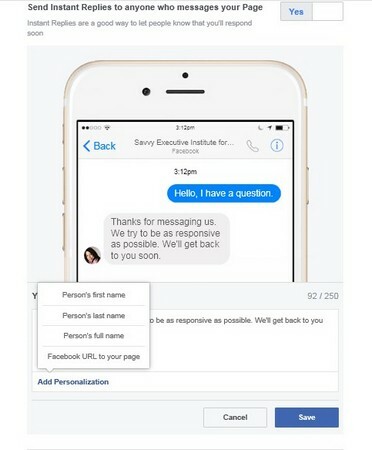 If you have created a chatbot for your Facebook Page, your customers will be able to type questions into a chat window and receive preprepared content that answers their questions. The content can include text, video, links, and images. One good example of a chatbot used to educate and entertain a company’s users appears on the Food Network Facebook Page. If you click the Send Message button, you see preset text saying that a company representative will instantly respond. It asks you to click the Get Started button. When you click that button, you are asked whether you want fun food facts sent to you; you can also ask for a recipe. This entire exchange is done by the chatbot. Another great example is the chatbot used by 1-800 Flowers. 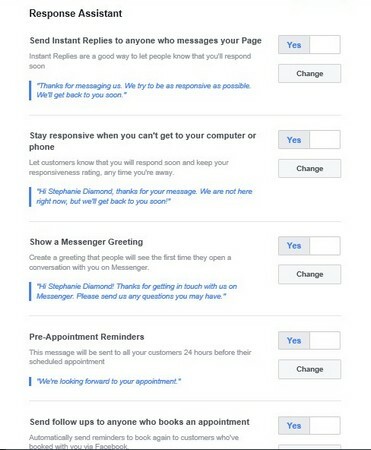 Its chatbot lets customers order right from the Messenger app on their Facebook Page. You can see how this encourages people to make a simple order. Messenger Platform: Select this radio button to go to the page where you set up how your chatbot will look. Subscribed Apps: The Apps that are connected to your Page will be automatically displayed here. Link Your App to Your Page: You need to enter an Apple ID to connect native apps. Whitelisted Domains: These are third-party domains that you say can be used with Messenger. Discover Settings — Discover Visibility: This setting allows your bot to be searched along with other bots. The default is Show. Unless you have a reason to make your bot harder to find, leave the default setting. Consult your webmaster or developer to ensure that your Messenger app performs correctly. Messaging: This section lets you set up how people can message your business Page and what messages they will receive in return. Use the Return Key to Send Messages: The default is Yes. Leave the default choice if you’re used to hitting the Return key after typing a line and want to do this when using the chatbot. Prompt Visitors to Send Messages: The default is No. If you click Yes, Page visitors will see indications that you are responsive to their messages. Go to Response Assistant and click Yes or No to the five choices you see. Creating settings for the Response Assistant. Send Instant Replies to Anyone Who Messages Your Page: The default is No. If you click Yes, you see a prewritten message that says, “Thanks for messaging us. We try to be as responsive as possible. We’ll get back to you soon.” You can choose to edit this message by clicking the Change button. When you click the Change button, a window pops open, showing you how your message will look on a mobile device. You can refine the message and click the Add Personalization link, which gives you the option to insert the person’s first name, last name, or full name, as well as your Facebook URL into your reply. When you’re done editing, click the Save button. Editing your Instant Replies message and choosing Add Personalization. (Optional) Personalize the name for each of the following settings. Stay Responsive When You Can’t Get to Your Computer or Phone: The default is No. If you click Yes, you see a message that says, “Hi [customer name], thanks for your message. We are not here right now, but we’ll get back to you soon!” You can choose to edit this message by clicking the Change button. If you do, a window pops open, showing you how your message will look on a mobile device. You also see a Schedule link that lets you set up the days and times on which the message will show when you are Away or Available. When you’re done editing, click the Save button. Show a Messenger Greeting: The default is No. If you click Yes, you see a message that says, “Hi [customer name]! Thanks for getting in touch with us on Messenger. Please send us any questions you may have.” You can choose to edit this message by clicking the Change button. If you click Change, a window pops open, showing you how your message will look on a mobile device. The greeting message is displayed and then the visitor’s question appears. When you’re done editing, click the Save button. Pre-Appointment Reminders: The default is No. If you click Yes, you will see a message that says, “We’re looking forward to your next appointment.” You can choose to edit this message by clicking the Change button. If you do, a window pops open, showing you how your message will look on a mobile device. When you’re done editing, click the Save button. Send Follow Up to Anyone Who Books an Appointment: The default is No. If you click Yes, you see a message that says, “Hi [customer name]! It’s been a while since we last saw you. We’d love to have you back!” You can choose to edit this message by clicking the Change button. If you do, a window pops open, showing you how your message will look on a mobile device. If you click the Schedule link, you can choose the number of times and the hour, day, week, month, or year that the follow-up message is shown after the previous appointment is booked. For example, if you’re a dentist, you may choose to have the message pop up 3–4 months after a person’s last appointment. When you’re done editing, click the Save button.